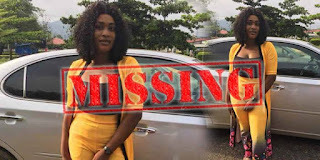 A student of Adekunle Ajasin University (AAUA) in Akungba Akoko, Ondo State - has been declared missing weeks after she finished her final exam and left for Lagos. The 400 level student of the department Political Science Education, Fanegan Temitope, left for Lagos after writing her final exam paper and celebrating with friends two weeks ago that they've finally graduated from the institution. According to reports, she is yet to reach her destination in Lagos till now and her phone has been switched off. Her family, friends and colleagues have been thrown into panic as to what might have happened to her. The case has been reported at the police station as efforts are being made both online and offline to locate her.